Bijna twee jaar geleden vond mijn eerste kennismaking met Keith De’Winter plaats, de creature performer die in The Force Awakens de rol van Goss Toowers speelde. Sindsdien is er (mede door onze gedeelde belangstelling voor voetbal) altijd contact gebleven en toen ik hoorde dat hij in The Last Jedi maar liefst drie (!) rollen speelde kon een tweede interview niet uitblijven. Naast Goss was Keith ook te zien als een Canto Bight alien en een mannelijke Caretaker op Ahch-To. Daar waar het interview in 2016 over The Force Awakens ging lag in onderstaande interview de focus volledig op The Last Jedi en schetst Keith een geweldig beeld hoe het er achter de schermen van ‘s werelds populairste franchise aan toegaat. Besides good ‘ol Goss Toowers which new roles did you play in The Last Jedi and how did you get them assigned? Well, after my little adventure on Star Wars: The Force Awakens, I never imagined I would be called upon again. I thought, “I’ve done my Star Wars!”, then I got the call to go to Pinewood, which was very exciting, for a fitting for a Creature I’d not played before on the unnamed next instalment. This creature turned out to be one of the Caretakers on Ahch-To, where Luke Skywalker went into exile seeking the first Jedi Temple. This Caretaker is one of the males of the species. The Caretakers you see in the film are all females. My Caretaker was described as a “Salty ‘Ol Seadog” character, basically he’s been there/seen it/done it, the wise old Caretaker that has endless stories to tell, and maybe stretch the truth a little. He didn’t speak, but that’s what I imagined he’d be doing. Quite a fun character to play. Of course I thought this was the only creature I was playing in this second instalment of the ‘New Trilogy’. I never imagined playing more than one. It was during one of the rehearsals where Vanessa Bastyan – Supervising Animatronic Designer CFX – said to me that my other creature I was playing was awaiting for me to have a fitting. So you can imagine how gobsmacked I was. 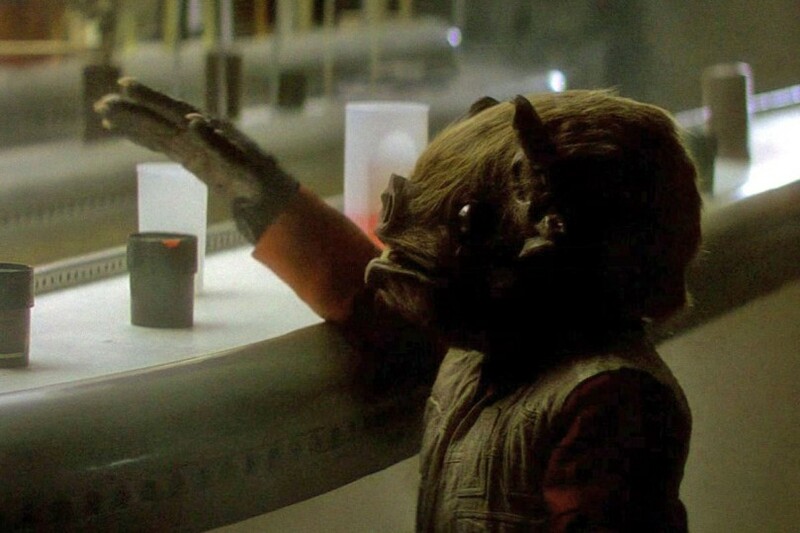 So the other creature was going to be a character on Canto Bight in the casino. This Creature has a kind of Toad look about him. He, like all the other Creatures in the casino are very well dressed, which was very apt as we filmed the scenes on the 007 sound stage. Which was an amazing set. It was wonderful to work in the same building where the James Bond movies were filmed. This is such an iconic sound stage and very fitting for such a huge set piece. The incredible detail in everything around, which made this the casino that Bond would loved to have played at. As of this time my Casino Creature doesn’t have a name, but he was described as a loser, a loser in everything. I remember when we were filming I had to walk over to a female alien creature, ‘Derla Pidys’, played by the lovely Latesha Wilson. So in keeping with this characters reputation I played him trying to ‘chat her up’. Of course Latesha couldn’t see a thing in her costume and was unaware of what I was doing, which proved even more embarrassing for this loser of a creature. During my fitting on the Caretaker I was playing, Vanessa informed me that Goss was also hanging on the rail waiting for me to put him back on. I’m playing Goss Toowers again, how exciting. I thought I’d seen the last of him after The Force Awakens so knowing he was back on this film was a real thrill. Sure enough, putting that costume back on just took me right back to my first day of rehearsals on ‘The Force Awakens’. During filming on one of the scenes I also got to play another creature for a pick-up shot, that was so cool, so, I suppose I actually played 4 Creatures in The Last Jedi. What can you tell about the suits you had to wear? Goss Toowers is really comfortable to wear. His costume consists of boiler suited overalls, wellies, three fingered hard wearing gloves, well, he is an alien, and a waterproof shirt-looking jacket underneath the overalls. The head, however, is very heavy. The reason for this is due to all the animatronics inside the top of the head/helmet and front behind his face to help bring him to life. I wore a balaclava and a special helmet fitted to my head that the head slotted onto, I looked like Batman. I also wore a bungee strap which would run up my back and clip onto the head to alleviate the weight. With this in place I was then able to move the head around as if it were my own, and with puppeteer Patrick Comerford operating the facial movements and also speaking into my ear via an earpiece which would help give me direction into what was going on in the scene, and stop me from waking into things, although that’s another story. My (as of yet unnamed) Casino Creature was also a very comfortable costume to wear. This Toad looking creatures costume consisted of everyday black shoes, a pair of trousers made to measure. I don’t even get mine tailor-made, and a long tuxedo looking black formal coat. I seemed to remember him also having a white kind of cravat with a brooch to hold it together. The head was a lot heavier than Goss, as he had a working mouth, so more animatronics/servos to make it all work. Again having the same fixture as Goss Toowers to help balance the weight to be controlled by my own head. I did quite a lot of walking up and down the elegant staircase you see in the casino that Finn, Rose and BB-8 use. Visibility wasn’t as restricted as wearing Goss but the only time I could see was when the mouth was opened. Even then what you could see all depended on how wide the mouth was opened. The (also as of yet unnamed) Caretaker was a fun character to play. This costume was the most difficult to wear, and also the biggest. The body was basically like putting in a turtle shell, as it slotted over your head and your legs stuck out the bottom of it and arms popped through the sides. The hands were separate from the body and you would put these on before the clothes went over the body. There were quite a few layers of clothes, this would make him look more weighty, finished off with a kind of fisherman’s coat and a matching hat. The legs are a different story and you don’t really see the legs/feet on the Caretakers that appear in the film. We had these bird looking stick legs/feet that were attached to the sides of our legs/feet. We had green tights on our legs and these would be erased in post, good job as I’ve got boney knees. The head on this creature was even heavier than my Casino Creature. This was due to the size of the head which was quite big compared to some of the other Caretakers. Again it contained all the necessary animatronics/servos to operate the eyes/mouth. Visibility being the same as the Casino Creature, in that what vision you had, all depended on how wide the mouth opened. Goss Toowers (midden) op de set van The Force Awakens, terwijl hij samen met JJ Abrams en Neal Scanlan (rechts) B-U4D (links) bekijkt. You had scenes filmed on the big resistance ship, the Canto Bight casino and Ahch-To. I’d love to hear everything about the filming of your scenes on these 3 very different sets! And were your Ahch-To scenes filmed at Skellig Michael? Let’s start with Goss and the Resistance scenes. Like I said earlier, playing Goss was such a pleasure. Back on the Resistance. Obviously when filming you’re limited to how much information is given. I was told what I had to do at that moment and be the technician that Goss is. So my ‘job’ this time around was to carry a fuel pipe across a very busy Resistance Base that had Resistance pilots/crew running around. I told you that I have no vision at all with Goss so my direction solely relied upon my puppeteer at that time which was Patrick Comerford via an earpiece. Luckily we got to rehearse what we were doing, so that does help as I count how many steps it takes for me to reach my destination. As director Rian called ‘action’, Patrick would then very quietly tell me if I had to turn left/right/stop/turn…and at the same time, I’m animating Goss to make him look ‘real’. So the fuel pipe I carry is what I then use to fuel the ship that Leia and gang are going on. I did see various characters going on this ship during rehearsal, but I had no idea why. Once all fueled, it was a big thumbs up to one of the crew and then I went and started to fix something else. I had a lot of fun in this scene. The Canto Bight casino was such a magnificent looking set. Quite a big set too as it was filmed on the 007 Sound Stage. Honestly, this could’ve very well been the setting for James Bonds next adventure! The amount of casino tables laid out, all occupied by wealthy individuals, all playing to become even richer. My Toad looking Casino Creature is one of the ‘losers’ at the tables. That’s what I got told and that’s exactly as I played him. I made up my own version of gambling at the table and my idea was to win you had to lose all of the golden chips you had…but I kept winning back more chips which make him a real ‘loser!’ I did lots of filming, but the only time you see him in the film is as we first enter the casino. The camera pans forward along the gaming tables with humans and aliens on both sides gambling away. Then we see a croupier on the right of the screen and my Casino Creature appears then. In fact, if you listen you can hear him growl, then Finn appears on screen. Other bits of filming I did that didn’t make the cut; there was a large staircase that I had to walk up and down and performing this with little vision is quite a feat. I remember I had to walk up these stairs following Finn and Rose. Once at the top I had to make my way around past the piano we see near the bar and stop and chat with alien creature, ‘Derla Pidys’. My facial expressions were puppeteered by Olly Taylor, who’s amazing. We had such fun and of course having him animate my mouth would make him provide a voice that I could hear via the earpiece. It’s a shame no one other than me could hear him as he was so funny, so I would animate along with what he said. Due to the nature of the scene and the amount of filming I did, I also had other puppeteers take over when Olly had to take the reins of another creature. Brian Herring was on hand when he wasn’t busy with BB-8, and Phill Woodfine helped to guide me around a very busy bar to talk to the female aliens to make sure I hit my mark. Creature Co-coordinator on the film, Paul Kasey, was always there talk to me via the earpiece if there was something specific he wanted me to do throughout this and other scenes during filming. This scene also involved lots of stunt work as Finn and Rose ride the Fathiers from the stables that come crashing through the windows destroying the casino. I was lucky enough to be a part of some of this stunt work. One shot in particular is when the first Fathier comes smashing through the window by the bar at the top of the stairs on the casino. I was standing with an alien creature, ‘Glowen Faquidde’, played by the wonderful Lynne Robertson Bruce. We were standing by the piano near the bar at the top of the casino and we were surrounded by stunt performers. On action we had to run as fast as we could as various gadgets would trigger the collapse of the piano as this was where the Fathier was to land as it crashed through the window. This was so exciting and both myself and Lynne would act as if this was our ‘stunt scene!’ Of course, it takes such a skill to do what these stunt performers do. I was involved with a couple of other stunt scenes just after the casino tables were flipped and stunt performers were flown through the air on safety wires. Amazing to watch and great to be a part of. Lots of running and in a creature costume with little vision are quite a task, but I’d love to do that again! The wonderful island of Ahch-To, or in my case, the wonderful island built at Pinewood! Again, what an amazing set. When you watch the film it’s so difficult to know which is the actual island, compared to Pinewood. So none of my filming was at Skellig Michael, playing the part of one of the Caretakers was amazing, after all, I thought that was the only character I would be playing. The way these creatures were described was that they are the keepers of the island. The male species would be the ones that would go off hunting off the island leaving the females to tend with all the everyday tasks, just as we see in the film. This, after all, is the island where Luke Skywalker has come to seek exile. He’s possibly the only human we know that the Caretakers have seen, so does he party with them? I like to think that he has done, a Jedi surely has to relax somehow. We had lots of preparation for this scene, lots of rehearsals that went into the way these creatures walk. As they have bird like legs and such a huge body, we had a particularly physical walk we had to learn. Paul Kasey choreographed a dance routine that we also had to learn for our ‘big’ scene. This dance had the added physicality to it based on how we moved our bodies. It was like doing a high intensity workout. Again I was fortunate to be puppeteered by Olly Taylor and another very busy puppeteer, Colin Purves. Before this interview you told me your scenes as a male caretaker were cut from the final movie. Could you describe those scenes? I hope they’ll show up on the Blu-ray! When you begin filming basically you only have certain information about that scene, even then it’s limited. I remember the scene quite well. It was an enclosed space that had the Caretakers huts placed around embedded onto the hillside/mountainside. There was also a bigger hut which more than one Caretaker could be inside; maybe this was an area to gather certain Caretakers for meetings. These huts were a bit different to the ones Luke lives in. To access these huts you would walk up, what I can only describe, as slated steps. I stood on a ledge, which felt pretty high as my vision was limited. In one hand I held a long staff and in the other, what appeared to be a rope made of twine that lit up when you twirled it around. So Paul Kasey would instruct me to wave my staff and swing my rope around, incidentally, when the Visual Dictionary came out I found out this was called a ‘Nightkelp Flail’ So with Olly or Colin working my face and eyes, I swung my ‘Nightkelp Flail’ around me and shook my staff as though I was conjuring up some almighty spell, which of course, I wasn’t! Some of the other Caretakers were dancing on the slated steps or in their huts, or by the blazing camp fire that was burning below where I was standing high on that ledge. Rian Johnson came over to me and directed some more for me to do; he said he wanted to finish this particular shot looking up at me. We also performed a dance routine around the camp fire and one of the shots I did incorporated Rey walking by the side of me. As I turned and saw her I looked her up and down as if she’d ruined my dance skills, this always made Daisy laugh. So, you can imagine how disappointed I was that this scene got cut from the film. Of course, this can’t be helped and various scenes in films are always cut for the sake of running times, or the general flow of the story. What’s exciting is that Rian Johnson recently announced that various deleted scenes would be appearing on the Blu-Ray/Dvd once it’s released. He did speak about this Caretaker scene in particular as it now transpires to be the scene involved in the 3rd one of Luke’s lessons to Rey. I’m so excited to know that I, along with all the fans, will get to see this amazing scene we filmed. Rian’s direction is completely different to that of JJ Abrams, but then it should be. 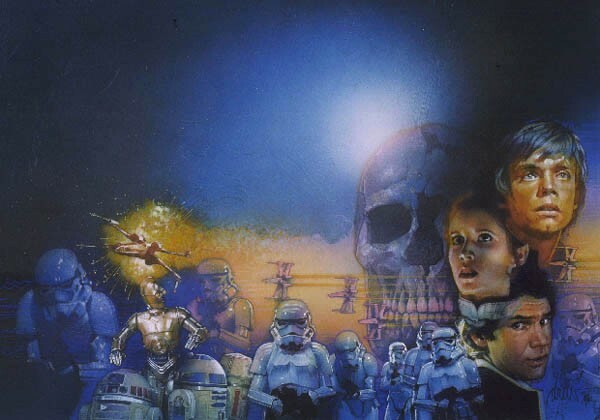 The one thing they have in common is the passion to tell the story of Luke Skywalker et al. Besides being directed by him, I had the opportunity to watch him in action on set. His attention to detail, his relationship with everyone involved was so naturally charming. He was always smiling, like a little kid in a sweet shop. A very hands on director, he would make sure he got the best out of a scene, and whoever was in that scene would make sure that what they did made him smile even more. My first introduction to Rian’s work was the film Looper. The depth of character development in that film just shows how much he was the right one to write and direct this episode of the saga. He’s very character driven and it shows in Jedi. You’re in scenes with almost every main cast member. Did you get to interact with them how do they perform ‘live’? I didn’t interact with Carrie as I did when I first played Goss in The Force Awakens, but at least we were in the same scene, that meant a lot. Filming on the casino I got to work alongside John Boyega and Kelly Marie Tran. When we filmed the scene with me walking up the casino steps towards the bar I was directly behind Kelly. As we stopped shooting she was totally engrossed in how I looked. She felt my hands and said they felt very ‘real’, she asked me my name and told me hers, although I still had my creature’s head on, so I don’t think we’ll be shouting hi to one another across a room just yet! When I took my head off for a breath of air, I looked, and at the side of me, watching Rian direct, was Mark Hamill. He would often be seen around various sets watching what was going on, that’s what actors like to do, makes you really feel a part of it. It was the same with the Caretaker scene. Filming alongside Daisy Ridley was nice and again she would laugh and stare in amazement at the look of the creature; all of this down to Neal Scanlan’s amazing team in the Creature workshop. Everyone’s entitled to their own opinion, just how boring would life be if we were all the same? It doesn’t matter if you don’t like something, it’s called an opinion, but that doesn’t mean you have to slam something for the sake of recreating your own childhood. I absolutely loved this film! Rian has got this story completely right. I was so enthralled with everything, and I wanted more. I love The Force Awakens and I didn’t think that could be bettered, but it takes the story exactly where we want it to go. For me it was taking me on that journey with Daisy, and Luke showing her the ways of the force. She’s such a strong character and that’s why she left the island, she knew it was the right thing to do, Luke knew it was the right thing for her to do. He had done the same in Return of the Jedi. In the last scene on the Falcon I did not see Goss… does this mean he’s… gone? Just because we didn’t see him, doesn’t mean he’s gone, this after all is Star Wars, and we all know that anything is possible. I would love to play Goss again if the opportunity ever rose. However, I was very fortunate to have played him in two films. He’ll always be my go-to alien! Solo: A Star Wars story will be released in may… and Episode IX in December 2019. What are the odds we’ll be chatting again then? I’m looking forward to seeing Solo: A Star Wars story, and I’m looking forward to seeing Episode IX in 2019…I told you, I’m just as much a fan as you are. It would be lovely to do another interview with you at later date, who knows?